So, you’re looking to break into the world of pet battling, eh? Good choice! Despite some issues with bugs and glitches, pet battles have made a fine addition to World of Warcraft. Most who have tried them have enjoyed them, and they bring something to the table for inexperienced players as well as people really looking to get into the meta-game of battling. The system can seem a little daunting at first, but with a little help and practice you’ll soon be on your way to becoming a master pet battler. In this guide I’m going to discuss the more basic aspects of pet battling, with a more advanced guide coming at a later date. Feel free to use the table of contents below to search for the section you’re looking for! A: This is the name/information about the pet you currently have displayed on the screen. If you hover over its little icon you can get more information about the pet including a description and where it can be found. B: These are your pet’s stats. The heart/green bar indicates its HP. The sword icon with the number next to it is its total attack stat. 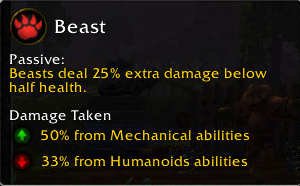 The attack stat obviously determines how much base damage your pet’s moves will do. The golden arrow with the number next to it is its speed stat. The speed stat determines how fast your pet is. 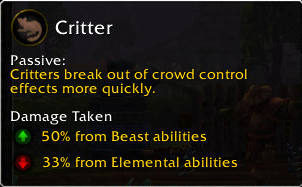 The faster your pet, the more likely it is to go first during pet battle rounds. C: This is the quality of your pet. This will tell you whether a pet you have caught is poor, common, uncommon, or rare. 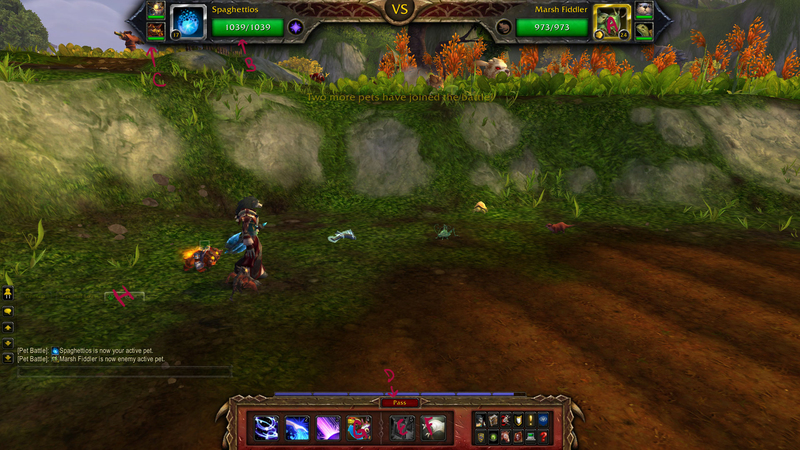 Note that before patch 5.1 you cannot see the quality of non-battle captured pets. 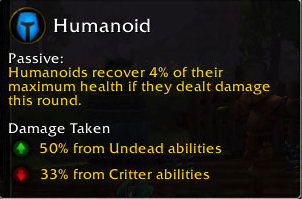 You will need to rely on their base stats or an outside website (like warcraft pets) to tell you the pet’s quality. D: This is your pet’s experience bar. It operates exactly the same way as your WoW character’s exp bar. Fill it up and your pet gains a level. At level 25 your pets will stop leveling and their exp bar will disappear. E: This is your pet’s moveset. These are the attacks/skills it can use in battles. As you level up you will unlock more moves which you can swap in and out using the dropdown arrows on this pet screen. Keep in mind that your pet can only have 3 moves for battles. F: This will queue you for a random PVP pet battle. The system will try to match you with people with similar level pets. However, it’s not always reliable. I prefer to avoid queuing until my pets are level 25. G: This button will act the same way a stable master does and heal/revive your pets on the go. It has an 8 minute cooldown though which makes it fairly unreliable. It’s always better to train near a stable master rather than rely on this. H: These are the pets currently on your pet battle team. To add pets to a certain slot you will want to drag them over from the pet list. The pet at the TOP of the 3 slots is the one that will go into battle FIRST. You will initially start out with 1 pet battle slot, but as your pets level up you will unlock the rest. You can use the dropdown menu to rename your pet as many times as you’d like. You can also choose to summon it, or set it as a favorite. With this you can sort by things like pet family, your favorites, etc. In this screenshot you can see that I have sorted by my favorite pets. This usually helps me keep track of the pets I am leveling and prefer to use in battles. If you’re looking for a certain family of pet so you can see where one is located, you can sort by family instead. If you’re new to the system you probably don’t yet have the level 25 pets required to use my powerleveling method. That’s fine! We just have to start from the beginning! The first likely place you will want to train is your home city, Stormwind or Orgrimmar. There are plenty of critters running around the city and stable masters nearby to help you heal. You can easily get your first chosen pet to level 5 just staying inside the city. Stable masters can be tracked on your map. They will charge you 10silver to heal/revive your pets. It is critical to stick near them while you’re training so you can keep your pets in fighting condition. Click here to open a link to all of the listed stable masters in WoW. And click here to open a link to the levels of pets by zone. You’ll want to keep both of these links open and select areas to go to specifically for leveling. 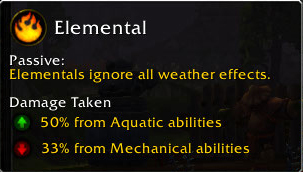 You’re going to need to keep traveling throughout Azeroth/Outlands/Pandaria to level your pets at an appropriate speed, so it helps to know where the closest stable master is. If you’re leveling your pets from scratch there is no real way to powerlevel them. You are going to need to follow the tried and true traditional RPG method of taking on pets 1-2 levels higher than you until you outlevel a zone, then move on to the next area. Initially your pets will only fight one enemy pet in a battle. 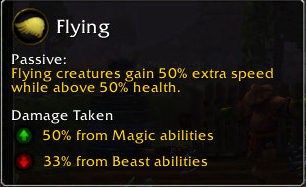 This number will go up to two wild pets at level 10, and then three wild pets at level 15. In order for a pet to gain exp in a battle it MUST do at least one attack and it MUST NOT DIE. 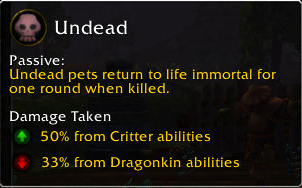 Dead pets do NOT gain any exp regardless of whether or not they fought in the battle or not. You CAN switch pets in and out during the battle, but you will sacrifice a turn to do so. If your pet is the same level of the enemy pets it is fighting it can probably take on 2 or 3 in a single battle. 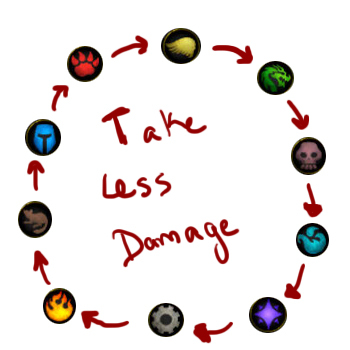 It’s usually best to focus on just using/leveling one pet this way, then your second pet, then your third so that they are all leveling evenly as you go. Healing at a stable master naturally makes things a lot easier. You can gain exp from fighting pet trainers and doing PVP battles, but it’s incredibly unreliable and PVP battles aren’t really worth the effort until you’re at least level 20+ and have unlocked your pet’s full moveset. The lower level pet PVP brackets are a lot like low level WoW PVP brackets. A lot of twinkish pets combos over and over again. 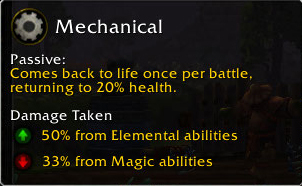 Off the top of my head I can assure you that you’ll be facing a lot of mecha/clockwork gnomes, pandaren monks, lil’ragnaros, and celestial dragons. (I’ll be writing a guide on how to counter these in the future!) And if you’re brand new to pet battling these combos can be hard to counter with the basic pets and limited movepools you may be using. Probably best to save yourself the headache and get used to the system by fighting wild pets for a while! A: This is your enemy’s portrait. You’ll notice that around it is a golden frame with the speed stat arrow in the corner. 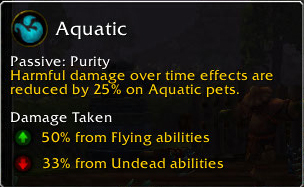 This means that this pet’s speed is the highest and it will go first during the round. There are certain buffs/debuffs that can increase and decrease speed. You will always be able to tell which pet is going first in a turn by which one has the golden frame over its portrait. B: This is YOUR pet’s information/HP bar. C: These are your other current battle pets. If the enemy team has more than one pet you can see their other battle pets on the right-hand side next to their portrait as well. D: The pass button. Sometimes your pet will be stunned or another situation will come up that requires you to hit the pass button. Passing sacrifices your current turn. E: This is the pet capture crate icon/button.When a pet is at low health this icon will begin to glow, indicating that you can capture the enemy pet. More on this in a minute! F: This is the forfeit button. Forfeiting causes you to immediately lose the match and run away. This button can be used in PVP battles and will award your opponent an automatic win. G: This is the pet swap button. Clicking on it will bring up a menu of your current battle team allowing you to swap in another pet to fight. Usually swapping a pet in will cause you to lose a turn, so you really want to consider a situation carefully before swapping a pet in or out. If your current pet dies you will automatically be prompted to swap in a new pet or forfeit. H: This is your pet battle combat log. You can use it to keep track of what has happened during the fight. You can also see your current pet’s moveset as well as its exp bar. To attack you’ll want to click on any one of your pets moves. I touched on catching wild pets above. It’s important to remember that you can only catch ONE wild pet PER battle. If you lose or forfeit the fight you will NOT receive the pet you captured. Whittle enemy pet’s HP down –> Throw pet trap. If the trap misses you lose your turn and the enemy pet will get to attack. Keep throwing traps until it is successful. Once the pet is trapped it will be rotated off the field. —> Win the battle and the capture pet is yours to keep! Pet qualities are also important. Currently there is no built in way to see an enemy pet’s quality without an addon. This will, thankfully, be changing in 5.1. 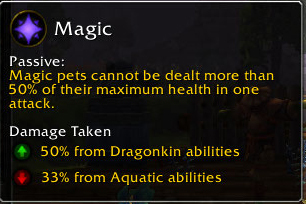 In the meantime click here to see a lightweight pet battle quality notification addon that will identify a pet’s rarity as well as whether or not you have already caught one. A very worthwhile addon, IMHO. Rarer pets obviously have better stats. As a general rule you will ALWAYS want to catch rare quality pets as you are leveling up/training unless you already have one. Catching as you go will allow you to have a broad pool of pets to choose from once you get into more serious pet battling down the line. You CAN use lower quality pets in battles, but chances are high that they’ll be demolished in fights against the higher level pet battle trainers/PVP battles. Most of the pets that you get from achievements, questing, etc. are defaulted to rare. SOME aren’t though. 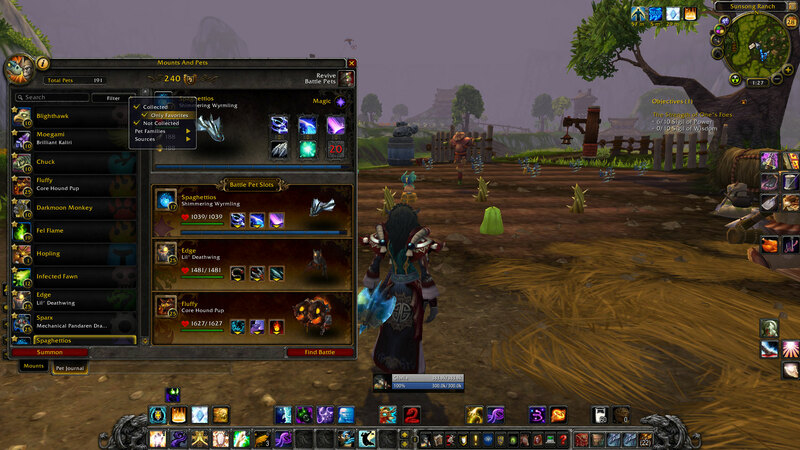 To check you can go to Warcraftpets and view each pets battle info to see its quality. For example, the Gilnean Raven pet is listed as defaulted to uncommon quality. All of the pet store and collector’s edition/special pets are rare quality. Much like other battle games, your pets have a type/family that determines its strengths and weaknesses. There are 10 types of pets families in the game currently. It’s important to note that regardless of your pet’s base family, some of its moves may belong to a different type. 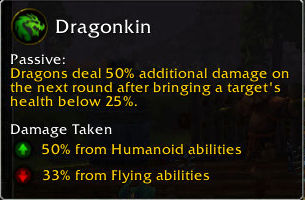 For example, my little Deathwing pet is a dragonkin type – but it has the move roll, a beast type move. This means that although Lil’Deathwing is a dragonkin, if it uses roll against a critter, the critter will take more damage because it is weak against the beast type move. Wow, confusing, isn’t it? It gets a lot easier to remember once you start battling more and more pets. But to help in the meantime I’ve created two diagrams to help you remember what is stronger against what, and what is weaker against what. Now, when it comes to choosing your teams you’re going to want to keep things varied. If you have 3 poor quality stormwind rats fighting for you, you’re probably going to have a bad time. If you’re just looking to train up some pets and have fun, feel free to use your favorites. Try to choose moves that do more than just a single chunk of damage. 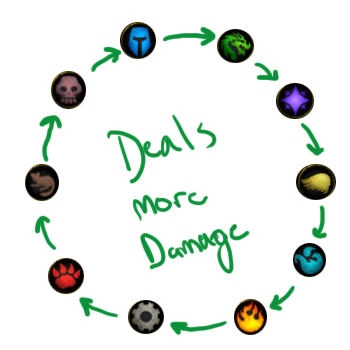 Moves that cause weather effects or buffs are a great asset to any pet battle team. We’ll get into that a bit more once I make my intermediate guide, though. Now get out there and start pet battling! This entry was posted in Guide, pet battles and tagged guide, pet battles by wowfailure. Bookmark the permalink. Thank you! *bookmarks* I love the little circley graphs 🙂 Great job! Pingback: Femtaur.com » Blog Archive » Femtaur Monday #18! nevermind i have a starter edition.. oops.